This articles shows how to read circuit diagrams for beginners in electronics. Learn to read electrical and electronic circuit diagrams or schematics. A drawing of an electrical or electronic circuit is known as a circuit diagram, but can also be called a schematic diagram, or just schematic. Circuit or schematic diagrams consist of symbols representing physical components and lines representing wires or electrical conductors. In order to learn how to read a circuit diagram, it is necessary to learn what the schematic symbol of a component looks like. It is also necessary to understand how the components are connected together in the circuit. 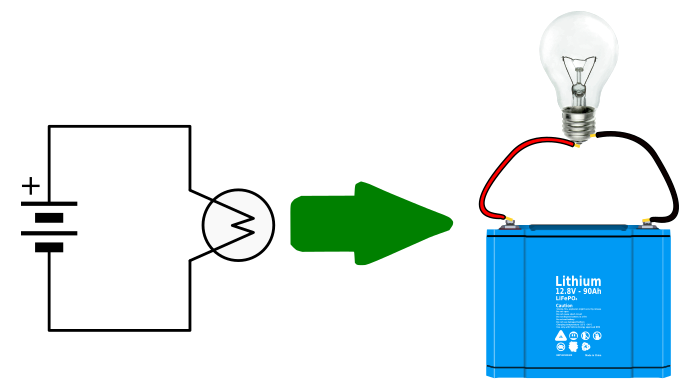 Probably the simplest circuit that can be drawn is one that you may have seen in a school science class: a battery connected to a light bulb as shown below. Each electronic or electrical component is represented by a symbol as can be seen in this simple circuit diagram. Lines used to connect the symbols represent conductors or wires. Each symbol represents a physical component that may look as follows. The physical circuit for the above circuit diagram may look something like the image below, although a more practical physical circuit would have a light bulb holder and clamps that connect to the battery terminals. A light bulb holder would have screw terminals to connect the wires to, and a socket to screw the light bulb into. Battery clamps would allow the wires to easily be connected between the battery and light bulb holder. Typically the actual battery type and bulb type would be specified in a component list that accompanies the circuit diagram. More information on the bulb and battery type could also be included in the circuit as text. For example, the battery may be specified as a 12.8V 90Ah Lithium battery, or a 9V PM9 battery. The light bulb may be specified as a 12V 5W incandescent bulb, or 9V 0.5W torch bulb. Components in a circuit should always have references, also called reference designators, used to identify the components in the circuit. This allows the components to easily be referenced in text or a component list. 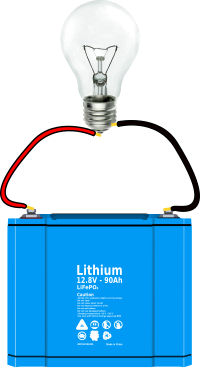 A battery may have the reference designator "BAT" and a light bulb may have a reference "L". Because there could be more than one battery or light bulb in a circuit, reference designators will usually always end with a number, e.g. BAT1 and L1 as shown in the circuit below. A second light bulb in the circuit would then have the reference designator L2. A component list can now refer to these components by reference designator. Circuit diagrams or schematic diagrams show electrical connections of wires or conductors by using a node as shown in the image below. 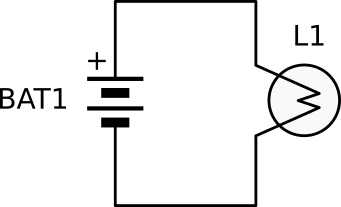 A node is simply a filled circle or dot. When three or more lines touch each other or cross each other and a node is placed at the intersection, this represents the lines or wires being electrically connected at that point. If wires or lines cross each other and there is no node, as shown at the bottom of the above image, the wires are not electrically connected. In this case the wires are crossing each other without connecting, like two insulated wires placed one on top of the other. In the circuit below, two light bulbs are connected in parallel to a battery power source. It can be seen that the top terminals of the two light bulbs are connected together and to the positive terminal of the battery. We know this because the three terminals or connection points have a node where they intersect. The bottom terminals of the bulbs are connected to each other and to the negative terminal of the battery, because the second node shows these connections. In the series circuit below, two light bulbs are connected in series. No nodes are necessary in this circuit to show the bulbs connecting to each other and to the battery because single wires are connecting straight to each other. Nodes are only placed if three or more wires are connected. The following are general circuit diagram rules. Wires or lines in circuit diagrams are usually horizontal or vertical. In some cases a diagonal line may be used which is placed at 45 degrees. Component symbols in a circuit diagram are usually placed horizontally or vertically. On very rare occasions a component may be placed at 45 degrees, but only for a very good reason. Circuit diagrams are drawn as simply and neatly as possible. This means that the physical implementation of the circuit may look different to the circuit diagram, but they are electrically the same. Lines connecting components can be thought of as insulated wires in most cases, with only the ends of the wires being bare conductors for electrical connection. When lines cross each other in a circuit diagram, they can be thought of as two insulated wires crossing if there is no node where the wires intersect or cross each other. 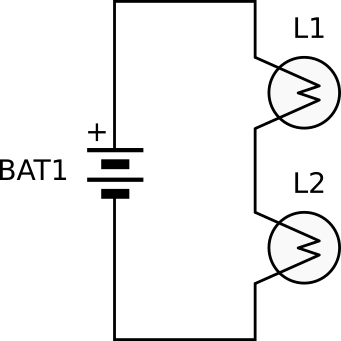 Three lines intersecting at a point with a node at the intersection means that the three wires are electrically connected. This connection can be thought of as three insulated wires bared at the point of intersection and soldered together. Two wires that cross each other with a node at the intersection of the crossing point means that the wires are electrically connected. When starting to learn to read electronic circuit diagrams, it is necessary to learn what the schematic symbol looks like for various electronic components. The Start Electronics Now electronics course for beginners consists of a series of tutorials for beginners in electronics. Following the course explains how to read basic electronic circuit diagrams while building the circuits on electronic breadboard. The course includes a list of basic electronic components with their schematic symbols where beginners can learn what the physical components and their symbols look like. After a four part introduction, the first tutorial in the electronics course shows the circuit diagram of a simple LED and resistor circuit and how to build it on breadboard. Basic components for this tutorial include an LED, resistor and battery which can all be found in the beginner's component reference. The best way for beginners to continue learning how to read circuit diagrams is to follow the course and build the circuits from each tutorial.